You know, I really should do the same. Iʻm forever knocking crumbs outa my keyboard! Mokihana- a definite advantage is that fabric feels better than faux wood. Ron, I can't fit a tablecloth on my computer hutch. It is 3 tiered, so the cloth would slide off. 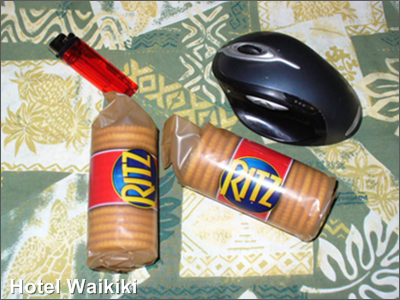 I haven't had Ritz crackers in years! LOL. The title is great. The photo is just one, tipped over, mostly empty bottle of whisky away from being the centerpiece of an art exhibit. See? This is what you get for not drinking. All that's missing is a placemat. gigi- the Ritz crackers was on sale for $2.50, 8-pack, at that. "This is what you get for not drinking." You may have a point. Cheers. Rowena- hmmm, a placemat? Forgot all about dat. I don't know. I just have clutter on mine.